New London Chamber Choir wishes to join the international musical community in paying tribute to Pierre Boulez, who was NLCC’s patron from 1984 until his death on 5 January 2016. Only three years after its foundation NLCC was invited to Paris, at the request of Iannis Xenakis, to perform a programme of Xenakis’ works together with the Ensemble InterContemporain. Despite his well-known distaste for the music of Xenakis, Boulez was present in the packed Théâtre de la Ville to witness a thrilling concert conducted by Michel Tabachnik; he also witnessed the sensational standing ovation which the choir received from a couple of thousand spectators. But it was Boulez’ subsequent acceptance of my invitation to become NLCC’s patron which was to prove to be the choir’s greatest accolade of all. Boulez’ patronage of NLCC was typical of his support and encouragement of young musicians’ engagement in uncompromising contemporary music, even if that music was not always to his taste. 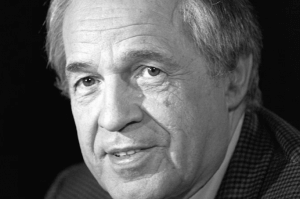 As is well-known, Boulez went on to found the world-famous Lucerne Festival Academy, and has fostered and supported the work of many young ensembles dedicated to achieving the highest professional standards of contemporary music programming and performance. It is my hope and belief that NLCC will continue to cherish the patronage of one of the very greatest musicians and composers of our time, and to carry the torch forward into the next generation of musical endeavour.